Find a vacation home to rent in Álora from our list of vacation rental properties. Campaya has over 10 vacation homes available in Álora, which give you the possibility to locate a unique accommodation in Álora which completes your check-list in search for the perfect self catering vacation apartments in Álora or vacation villas in Álora. This traditional style holiday home awaits you for a relaxing stay in a peaceful area surrounded by a large farm land, where the owner of the property lives just 400 metres away. 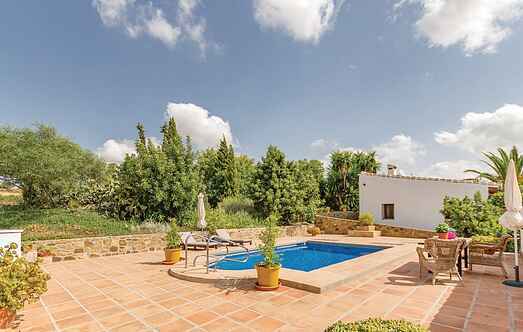 This delightful country house in Bermejo is ideal for a relaxing holiday. This traditional-style holiday home awaits you for a relaxing stay in a quiet area on the site of a ranch where the owner himself is located at a distance of about 800 m.
This traditional style holiday home awaits you for a relaxing stay in a tranquil area surrounded by a large farm land, where the owner of the property lives just 400 metres away. This rustic holiday home with pool offers 2 bedrooms, 1 living room, kitchen and bathroom. In the evening, you can have a barbecue on the terrace and have a swim in the pool. This farmhouse, built in traditional Andalusian style, has been lovingly restored and has all the modern amenities. It is capable of housing eight guests. This rustic holiday home with pool has 2 bedrooms, 1 living room, kitchen and bathroom. Surrounded by mountains, this holiday house is located amidst an incomparable and spectacular landscape.